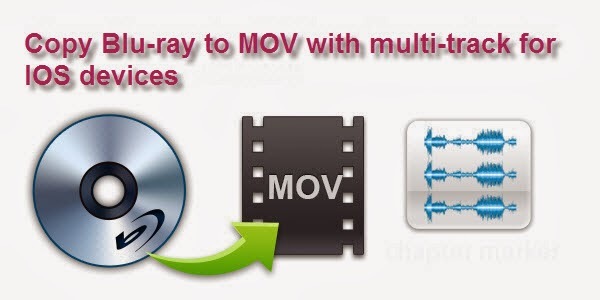 Summary: This article tells how to convert Blu-ray to MOV with several languages (audio tracks), so we can watch them on iDevices smoothly. With more and more advanced features built-in Blu-ray technology, it seems Blu-ray has ruled Home Entertainments. One question is, when you want to play Blu-ray movie on your IOS devices with the option of switching audio tracks to get different languages, you will be frustrated by numerous Blu-ray protections and limitations. Don't worry, this Blu-ray to multi-language MOV tutorial will help you out to backup Blu-ray to MOV keeping all your wanted audio tracks. So you can watch them on iPad, iPhone, iPod touch smoothly. To accomplish all the tasks, Pavtube ByteCopy is really recommended. This ByteCopy works as the pro version of normal Blu-ray ripping tools, which is capable of rolling off Blu-ray protection and transcode your movie to MOV format with best quality. Mac version is available here: Pavtube ByteCopy for Mac; well support Mac Mavericks! How to copy Blu-ray to MOV with multi-track for playback on iOS devices? Click the "Load file(s)" icon to import Blu-ray disc (need an external Blu-ray drive), Blu-ray ISO image files and Blu-ray folder. 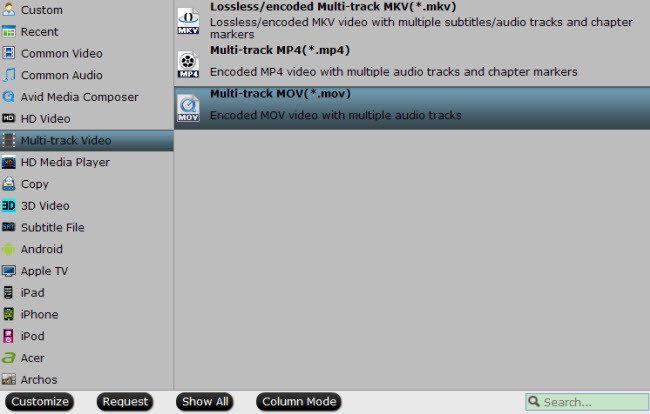 Click the "Format" drop-down list and choose "Multi-track Video>Multi-track MOV(*.mov)" for IOS devevices. Click "Format" to adjust video settings like video size, bitrate, frame rate, etc. Switch to "Audio" tab, you can free choose wanted audio tracks and set the audio channel. Back to main interface and click the big "Convert" to start converting Blu-ray to multi-track MOV for playback on iPad, iPod, iPhone. After conversion, click "Open output folder" to quick locate the converted video. Find VLC for IOS in AppStore and install it to your IOS devices. 2. Transfer your multi-track MOV videos to iDevices via iTunes. Connect your iDevices to your Mac via USB cable, switch to App tab, find VLC icon, click "Add" to add converted multi-track MP4 into this app. 3. Play multi-track MOV movie with desired audio track with VLC on iDevices.